Home » PSP 6.20 Pro-B5 LCFW released! Virtual Flame AKA Liquizigong has released an update for his 6.20 Pro LCFW. Aside from working on bugfixes from the earlier 6.20 Pro-B4 release, there are also specific game fixes for DJMAX3 to make it work with 6.20 Pro-B5. This was released in parallel to 6.35 Pro-B5. No need to install the previous releases to be able to install 6.20 Pro-B5. You do need to be on 6.20 OFW however. 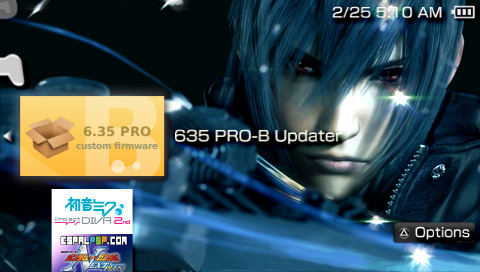 If you’re not on 6.20 OFW and want to install 6.20 Pro-B5, follow this guide: HowTo: Upgrade your PSP to 6.20 OFW. Important Update: 6.20 Pro-B6 is now available. Important: Install the permanent patch AFTER you install 6.20 Pro-B5. To install, just place the folders from the zip file into PSP/GAME and run 6.20 Pro-B5 from your XMB. Use the fast recovery to reload 6.20 Pro-B5 LCFW without doing the reinstall process again. Be sure to have 6.20 Pro-B5 installed. I have install 6.20 Pro B5 on my PSP 3001 Brite 3g all is great. I am just wonder do you think the perm patch is worth the risk in your opinion? For me no. The perma-patch will just save you a few seconds of re-running the LCFW from coldboot. Other than that it doesn’t seem to be worth much. sylv3rblade is right. a few seconds of reinstalling the CFW is more desirable rather than installing the permanent patch with a 50/50 risk of having your PSP unusable. Is this applicable on a PSP2006? Is this applicable on a PSP 1000 (FAT)? how perma-patch can brick a PSP or instances? Is there anything that doesn’t write to flash0 these days? Something completely reversible like 5.03 Gen-C? You can use 6.20 TN-E.
can I ask a question? can I put iso games after installing the 6.20 Pro B5? Hi sy, ni run ko yung 6.20 Pro-B5, pero yung Permanent Patch pag ni run ko balik lang sya sa XMB, ganun ba talaga? Pag pinatay ko yung PSP balik sa 6.20OFW… Ano mas maganda 6.20 Pro-B5 o 6.20 TN-D? salamat ulit. does iso cso playback support mean you can play isos straight from xmb without having to install a plugin manually? 6.20 PRO-B5 work on my psp? Yes. It will work with your PSP.